Xbox One Stereo Headset and headphone Adaptor coming in March | What Hi-Fi? Microsoft has confirmed the launch of an Xbox One Stereo Headset and Adapter, the latter of which will allow you to use compatible gaming headphones. The Xbox One Headset and Adapter will launch in March, with UK retail prices of £60 (for both) or £20 for the adapter on its own. The Xbox One Adapter will bring the same functionality afforded on the Xbox 360, allowing you to hear Xbox voice chat in your headphones – but not in-game music soundtracks. In order to hear in-game music as well as friend chat you will need to connect directly to the Xbox One via an optical cable or to your TV via analogue RCA jacks. This is contrast to the PS4, which allows you to use any headphones or headset and allows you to chat to friends as well as hear in-game music. The Xbox headset has control buttons allowing you to adjust the volume of both the game music and Xbox chat, or simply mute the sound. The adaptor works with 2.5mm or 3.5mm headsets. 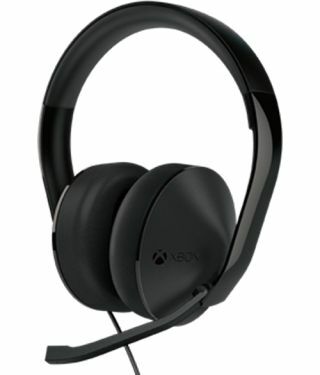 You can see a list of compatible Xbox One headsets on the Xbox.com website.